The force of this butane hash lab explosion outside of Eureka knocked the house off its foundation and lifted the roof off the walls. First came the explosion, and it came out of nowhere. 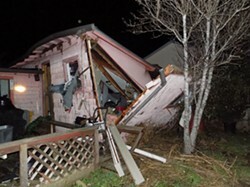 Cindy Dobereiner was sitting next door in her canary yellow Craftsman home when the walls shook and the windows rattled. About a block away, down First Avenue, Michael and Lindsay Goodwin were in their new two-story home when the concussion from the blast hit. They said it felt like somebody had taken a battering ram to the door. Then came the flames, and as they reached some 40 feet in the air, what sounded like gunshots — hundreds of them — echoing down the quiet residential street, piercing the quiet shortly after dusk on Nov. 9, 2016. Screams for help followed. "It was like you were in a war," Dobereiner says. "I know it sounds stupid but it was amazing. "The flames were so high. It was getting bigger and bigger, redder and redder. Then it would flame out." Hearing the screams, Dobereiner's husband, Vern, rushed next door to Tamara and David Paul's place and their daughter followed. They found three burned men and the small detached garage in the Pauls' backyard fully engulfed in flames. One of the men just took off running down the street, still smoldering, Dobereiner said. The other two were in no condition to run. One sat dazed on the curb, smoke pouring off him, as Dobereiner's daughter tried to douse him with water to stop the burning. "She said, 'Mom, I thought he had gloves on because when I poured water on him, the gloves just fell right off. But they weren't gloves,'" Dobereiner said. Meanwhile, Vern Dobereiner was in the backyard with the hose, trying to care for the other man, who kept yelling for help. "He just kept screaming and screaming," she recalled, pausing, adding after a moment that the man's "hair was burnt down into his head, his beard melted to his face." And, as Vern Dobereiner and his daughter kept trying to help the men, butane cans kept exploding and shooting out of the blazing garage. One came clunking down into the street, another in the driveway, one on the Dobereiners' roof. One whizzed by Vern Dobereiner's head. 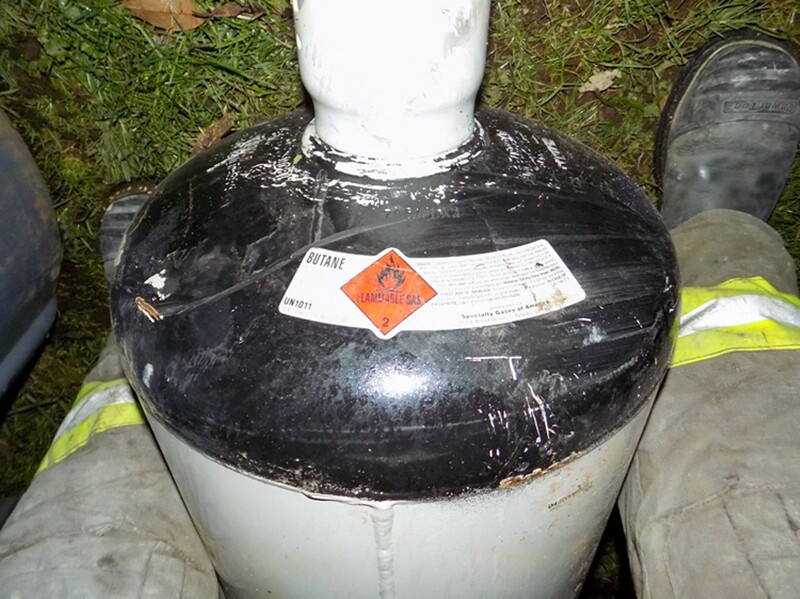 What would become clear as the three young men — Xavier Renner, Arron Mohr and Aaron Schisler — were taken to the hospital with third-degree burns covering an estimated 60 to 90 percent of their bodies is that the explosion was the result of a butane hash lab. It was an operation that no one in the neighborhood seemed to know was in the backyard of Tamara and David Paul, a tax preparer and a truck driver, respectively, who'd been in the neighborhood for almost a decade and had a 5-year-old daughter. Five weeks later, Renner died in the University of California Davis Medical Center's burn unit of a secondary infection at the age of 21. Still, no one on Rio Dell's First Avenue seemed to expect the police to come knocking with murder warrants. But they did. It's hard for most to understand a murder charge like this, hard to square the lack of malice or intent with its gravity. But malice and murderous intent aren't necessary to win a conviction under what's known in California as the felony murder rule. A legal doctrine, the felony murder rule holds that if Person A is knowingly committing any one of certain felonies and Person B dies during the crime, Person A can be charged with Person B's murder as the death was a foreseeable result of the underlying felony. "Once you start down the road of a felony, you are responsible for whatever results," explained University of California Hastings School of Law professor David Levine in a previous interview. "The chain of causation just gets started and you are responsible for getting it rolling." The classic example: Two men decide to rob a bank. During the robbery, police fatally shoot one of the men. The surviving suspect can be charged with his accomplice's murder because his decision to commit a felony — in this case, bank robbery — is inherently dangerous and led directly to his accomplice's death. An affidavit in support of arrest warrants filed after the arrests of Mohr and the Pauls earlier this month gives a brief overview of the case against them and Schisler, who remains wanted. At some point a few weeks after Mohr had started using the shed, Tamara Paul smelled gas and went into the garage to investigate, finding Renner and Mohr with a "small" case of butane, according to the affidavit. She allegedly told investigators that the young men told her they were just making a small amount of hash and that she told them to be careful. "She told them not to blow up her garage doing that," the affidavit, prepared by Humboldt County District Attorney Investigator Marvin Kirkpatrick, states. "I asked Tamara if she told the guys to knock it off and she told us she told them to be careful, she has her kids there, she'd rather them not do that but this was the end of it and she turned a blind eye to it." The affidavit also notes that Tamara Paul told investigators that Renner, Mohr and Schisler were coming to the property several times a week leading up to the explosion. When police served a search warrant the day following the blast, they reported finding hundreds of butane canisters, six metal extraction tubes (some with marijuana inside them), a vacuum pump and other items associated with butane extraction. They also reported finding small amounts of methamphetamine and psilocybin mushrooms on top of a gun safe in the Pauls' residence. In court Sept. 18, the Pauls pleaded not guilty to charges of manufacturing a controlled substance, manufacturing concentrated cannabis using a volatile solvent, allowing a place for preparing a controlled substance, child endangerment, drug possession and murder. Mohr, for his part, pleaded not guilty to charges of manufacturing a controlled substance, manufacturing concentrated cannabis using a volatile solvent and murder. Tamara Paul — clad in a blue jail jumpsuit, her hands cuffed in front of her — wept throughout the hearing, less than a week after she turned her 6-year-old daughter and infant son over to a family member as police took her into custody. It's unclear exactly how Renner wound up spending time in Humboldt County and involved in its cannabis industry, but it seems Mohr may have been the connection. Renner, Mohr and Schisler all went to school together at San Diego's Junipero Serra High School and appear to have run with the same circle of friends. After graduating, Mohr enrolled at Humboldt State University, attending from the fall of 2002 through the spring of 2014. And, based on the affidavit, it seems Renner joined Mohr at a grow scene in "the mountains" at some point the following summer or fall. Daniel Figueroa, who described himself as Renner's best friend, said he and his friends are still having a hard time processing the 21-year-old's death. Some of them have tributes to Renner on their Facebook pages and several approached by the Journal declined to be interviewed, saying it's too painful for them to talk about. In a series of Facebook messages with the Journal — he declined to be interviewed by phone — Figueroa described Renner as "brilliant," a unique mixture of street smart and book smart, and the greatest guy he ever met. Renner was a talented poet, Figueroa said, and the two would often go to poetry slams in San Diego's North Park. "He made words beautiful," Figueroa said, later adding that Renner was never satisfied with his work because "the greatest artists don't realize how brilliant they are." But mostly, Figueroa said, he and Renner would just hang out, talking about girls, anime, comics, politics and life. Renner lived in San Diego almost full time — Figueroa said he lived with his grandmother, "an absolute angel," as her primary caretaker — but would take trips to Humboldt. The Journal's last questions to Figueroa about Mohr and Schisler and the murder charges went unanswered. 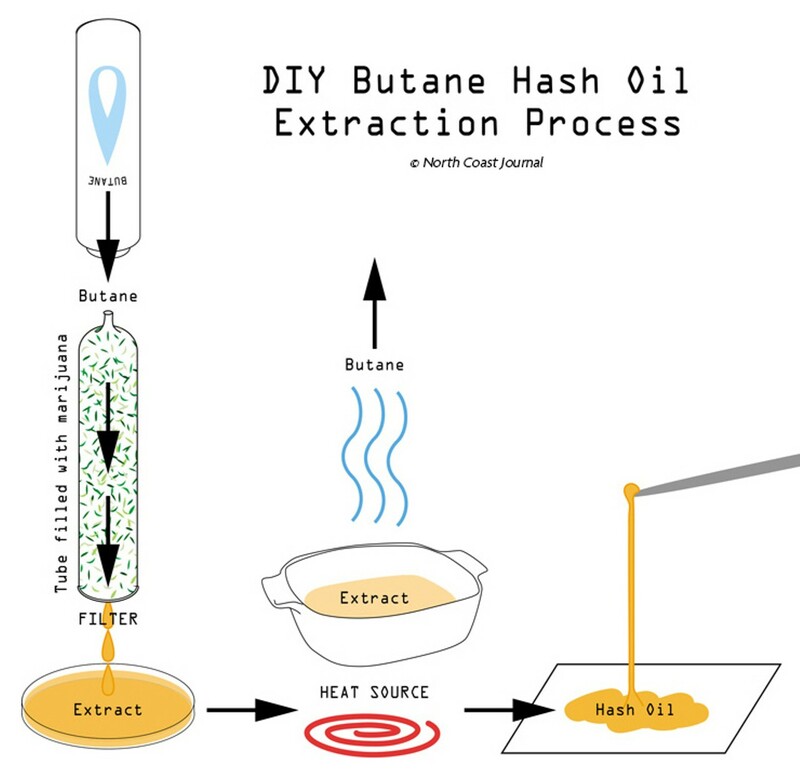 Butane hash oil extraction, an inherently dangerous and volatile process, has become a central component of the new marijuana industry. Potent concentrates now make up about half of all legal recreational marijuana sales in Colorado and insiders expect shatters, oils and hashes will soon dominate the entire market. Cannabis concentrates have been around in some form for thousands of years but the traditional methods of separating marijuana's psychoactive properties — THC, cannabinoids, terpenes and terpenoids — have given way to new processes in a quest for an ever purer, more potent product. The go-to method has become butane extraction, which results in products like shatter, wax and honeycomb. While high-grade marijuana bud currently contains around 20 to 25 percent THC, these new concentrates — which are semi-solid and a golden amber color — can test at up to 90 percent THC. Butane extraction involves taking a long plastic, glass or metal tube filled with marijuana plant matter and pushing butane through it. The butane strips the plant matter of THC, leaving behind a golden liquid. That liquid still contains butane, however, which must be evaporated off, usually in a two-step process involving hot water and a heating pad. But butane, once purged from its container, becomes a fugitive gas that's heavier than air. In a poorly ventilated space, the combustible gas will pool at the floor and build up until it escapes or hits an ignition source — which can be anything from a pilot light to a spark of static electricity — and explodes. 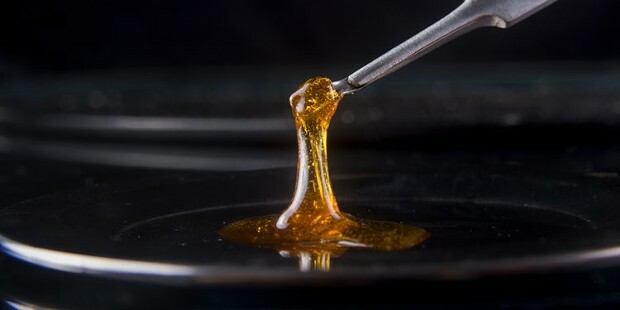 To make shatter — a hard concentrate with an amber, stained-glass-like appearance — folks add the additional step of "winterizing" or "dewaxing" to remove marijuana plant wax from the butane extract. This is often done by putting the extract into a canning jar with acetone or isopropyl alcohol, and placing the jar into a freezer for 24 to 48 hours. This adds another layer of danger, as the gasses from any remaining butane in the extract and the added solvents can pool and ignite when the freezer's fan clicks on. It's unclear which of these hazards caused the garage on First Avenue to explode, as the affidavit doesn't say if fire investigators discovered a point of origin for the blaze. (The Rio Dell Volunteer Fire Department declined an interview request for this story). 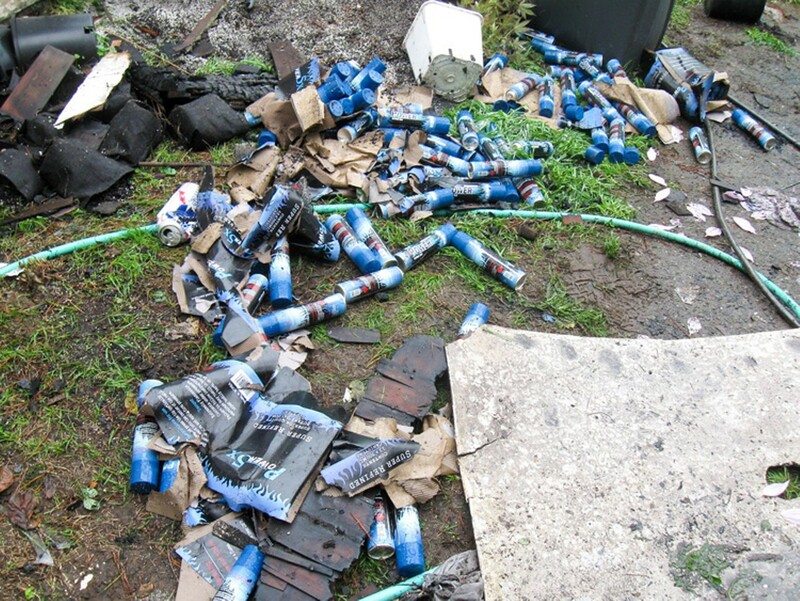 But what is clear is that there was enough butane on site there to do a lot of damage. Speaking generally of hash lab fires, Humboldt Bay Fire Chief Bill Gillespie said, "You look at a 10-ounce container of butane, and you let all of that go in the process of trying to render out, just that one can is enough to blow all of the windows out of a house." At the Rio Dell fire, investigators found hundreds of those little 10-ounce cans. These types of fires are so dangerous — and so prone to large, secondary explosions — that Gillespie's department no longer sends firefighters into structures to fight them unless they believe someone is trapped inside. The department also successfully pushed the city of Eureka to adopt an ordinance prohibiting people from possessing or purchasing more than two cans of butane at a time and requiring sellers to record buyers' identities. A couple of statewide bills have also been introduced in the Legislature seeking to curb butane's use in makeshift hash labs. After a period early last year, when Gillespie's department reported that almost 20 percent of its structure fire calls over a five-month period were butane hash lab explosions, things have quieted down some, with only one lab-related fire so far this year. But the chief was quick to caution the weather is starting to get colder and we're in the midst of the traditional marijuana harvest months, so he's still worried about seeing a spike this winter. Asked if he thinks this murder case out of Rio Dell might have a chilling effect on the illicit butane hash industry, Gillespie pauses. "Maybe it helps open the eyes of folks to the fact that it is super dangerous to do this," he said. "As we've seen in many cases, we end up with people hurt." Levine, the Hastings law professor, said there's little question that the felony murder rule is applicable to the alleged facts of the Rio Dell case. But he cautioned it might be hard to get convictions. "Sometimes it is hard for a jury to accept that felony murder is an appropriate conclusion," he said. And that might be especially true in this case, Levine said, where two of the defendants — themselves having been badly burned — were good friends with the victim and the other two — a working class couple with two young kids — apparently had little involvement with the extraction operation. In the case of David Paul, there's nothing in the affidavit even alleging he knew of the butane on site or the hash-making activities. It's also worth noting, a husband and wife can't be forced to testify against one another under California law. So prosecutors might face an uphill battle if this case makes it to a jury. Humboldt County District Attorney Maggie Fleming declined to talk much about the case or offer the thought process that went into her decision to charge all four defendants with murder. She did, however, indicate that achieving case-specific justice is only one component of these decisions. "To avoid the possibility of harming our effectiveness, in general I don't comment on criminal cases being prosecuted by our office," she wrote in an email to the Journal. "I can say our case-by-case decisions are all made with the two goals of improving public safety and achieving justice." But back on First Avenue, where things had returned to a normal state of quiet, not too many neighbors were jumping to the Pauls' defense. Dobereiner said Tamara Paul told her after the fire she had no idea there was a butane hash lab in her garage. Informed that her neighbor allegedly told investigators otherwise, Dobereiner said people have to face the consequences of their actions. Others seemed to agree and admitted they were having a hard time squaring the image they had of the family next door with the danger their actions allegedly put the neighborhood in. Still sitting on her porch, Dobereiner said her grandkids, who live with her, still have post traumatic stress symptoms from the blast, jumping whenever a car backfires or a balloon pops. And she said she can't shake some of the images and memories from that night — the smoldering man running down the street, the big red fireball coming from her neighbors' garage, the heat on her skin as she hurried a safe distance down the street. And, worst of all, the sounds of that man screaming. "He was a mess," she said. "He was just saying, 'Help me. Help me.'"